Boeing and Airbus delivered 54 and 74 commercial jets in March 2019, compared to 91 and 56 deliveries, respectively, in the same month last year. Boeing’s deliveries took a severe hit following the March 10 crash of Ethiopian Airlines Flight 302, a 737 MAX, and the subsequent deliveries halt and grounding of the fleet. Boeing delivered 11 737 MAX jets in March, with the last aircraft leaving the factory floor on March 11. Boeing decided on March 14 to suspend all deliveries of 737 MAX jets. 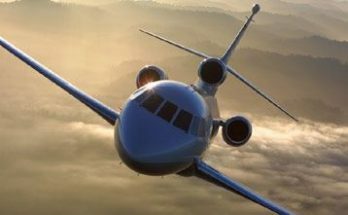 The crashes are believed to have been caused by the aircraft’s Maneuvering Characteristics Augmentation System (MCAS), which suddenly activated in response to erroneous angle of attack information. In 2018, Boeing delivered 806 jets (763 in 2017), with Airbus handing over 800 (718 in 2017). With 149 deliveries this year to date, Boeing is 35 shipments behind last year’s total for the first quarter. Airbus has delivered a total of 162 jets in Q1 2019, compared to just 121 during the same period last year. In March 2019, Boeing delivered 23 737s (of which 11 were 737 MAXs), or less than half the monthly rate of 52 jets due to the suspension of 737 MAX deliveries. The company also delivered a single 747-8F, six 767s, seven 777s and 17 787s. Boeing is currently in the process of raising the monthly Dreamliner production rate to 14 aircraft. 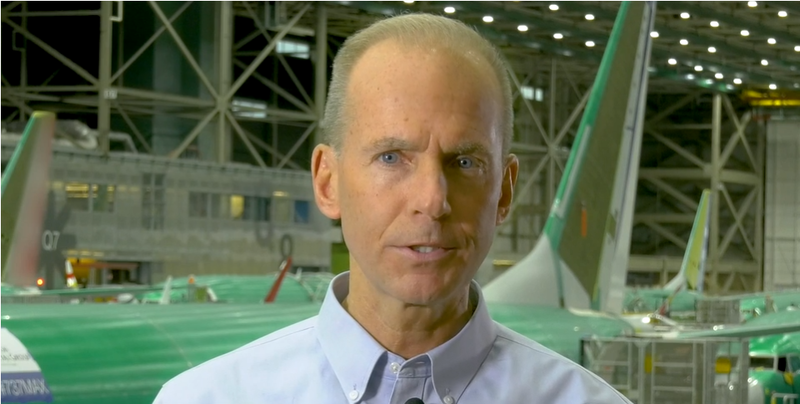 Boeing’s CEO Muilenburg commented on January 30: “We have started transitioning to 14 a month in our factories and supply chains as we prepare to begin delivering at this higher rate.” Boeing delivered 145 787s in 2018, up from 136 in 2017. During 2018, Boeing raised its 737 production rate to 52 and was planning for a further increase to 57 per month from early June this year. In the aftermath of the 737 MAX crash, Boeing has decided to temporarily reduce its 737 production rate to 42 per month from mid-April. This will allow the company to prioritize additional resources to focus on software certification and returning the 737 MAX to flight. As of April 11, Boeing had made 96 flights to test its MCAS software update. According to Muilenburg, during test flights, the software update has functioned as designed. A total of 256 737 MAX jets were delivered in 2018, up from 74 in 2017. 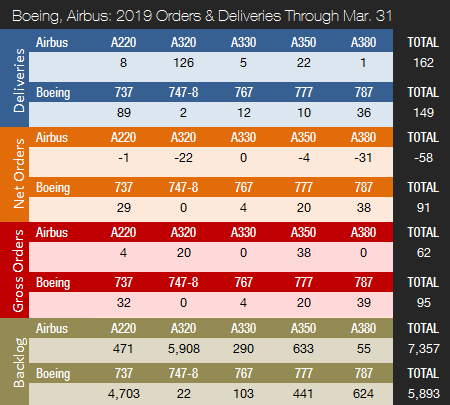 In March 2019, Airbus delivered five A220s, 57 A320s (13 CEO / 44 NEO), three A330s, eight A350s, and one A380. A total of 386 A320neo family aircraft were delivered in 2018, up from 181 and 68 in 2017 and 2016, respectively. By mid-2019, Airbus expects to be delivering 60 A320 jets per month on average. The company has internally been debating rates above 60 aircraft. Airbus delivered 93 A350s in 2018, up from 78 in 2017, and recently increased the monthly production rate to 10. Airbus is considering a further increase to 13 A350s per month in 2019. The ramp-up of A350 XWB deliveries combined with a higher A320 production rate means that the company has almost closed Boeing’s deliveries lead and could surpass its top rival already this year. With 43 net new orders in March, Boeing had a satisfactory month in the orders race. In dollar terms, the order haul was particularly good since all but three aircraft were high-value widebody jets. Boeing logged 47 gross orders (four cancellations => net of 43). British Airways placed an order for 18 777X (777-9) jets, the first order for this model in nearly two years. Furthermore, Lufthansa ordered 20 787-9s while DHL ordered two 777 Freighters. Also, Boeing’s leasing arm, Boeing Capital Corporation (BCC), ordered a single 787-9. Finally, private customers ordered three Boeing 737-based BBJ narrowbody business jets. For the full-year 2018, Boeing managed to book 893 net new orders (1,008 gross orders). 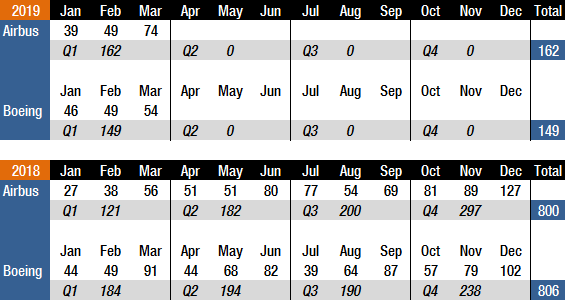 In the orders race, while orders finally picked up pace in March, Airbus has so far had a terrible year, mainly due to a surge in cancellations. In March, Airbus booked 58 gross orders and reported 17 cancellations => net of 41). This comes on top of 90 cancellations in February and 13 in January. Of the 120 cancellations this year to date, 31 are A380s due to Emirates’ decision to reduce its A380 orders book. This decision subsequently forced Airbus to announce that it will cease A380 production in 2021. In March, Taiwanese start-up airline StarLux ordered five A350-900s and 12 A350-1000s. Taipei-based StarLux expects to launch its first flights in January next year and aims to be a luxury carrier catering to high-income individuals and business travelers. Also in March, Lufthansa placed an order for 20 A350-900s, while a private customer signed up for a single A350-900. Furthermore, an undisclosed customer ordered 20 A320neos. In 2018, Airbus landed a total of 747 net new orders (831 gross orders), thereby losing the 2018 orders race, as Boeing had accumulated 893 net new orders. Airbus had retained an orders lead over its rival every year since 2012. 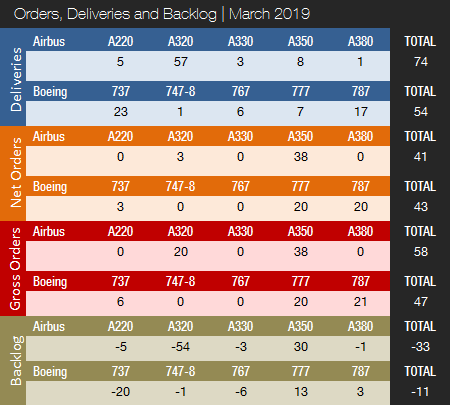 On March 31, 2019, Airbus’ backlog was 7,357 jets (of which 6,379, or 87%, are A220 and A320ceo/neo family narrowbodies), not far below the company’s all-time backlog record high of 7,577 jets set in December 2018. By the end of March 2019, Boeing’s backlog was 5,893 aircraft (of which 4,703, or 80%, are 737 NG/MAX narrowbody jets). Boeing’s all-time backlog high of 5,964 aircraft was set in August 2018. The number of Airbus aircraft to be built and delivered represents 9.2 years of shipments at the 2018 production level. In comparison, Boeing’s backlog would “only” last 7.3 years. This year to date, Boeing’s book-to-bill ratio is 0.61, up from 0.51 a month ago. Airbus’ book-to-bill ratio is negative. In 2018, Boeing boasted a book-to-bill ratio of 1.11, with Airbus at 0.93. In 2017, Boeing booked 912 net new orders for a book-to-bill ratio of 1.20. That same year Airbus booked 1,109 net new orders, for a book-to-bill ratio of 1.54. 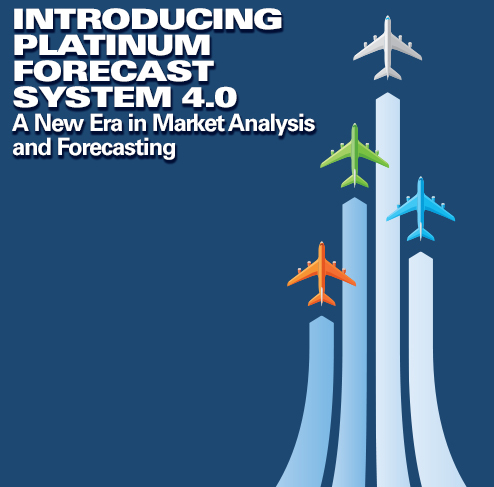 Forecast International’s Platinum Forecast System® is a breakthrough in forecasting technology that provides 15-year production forecasts. 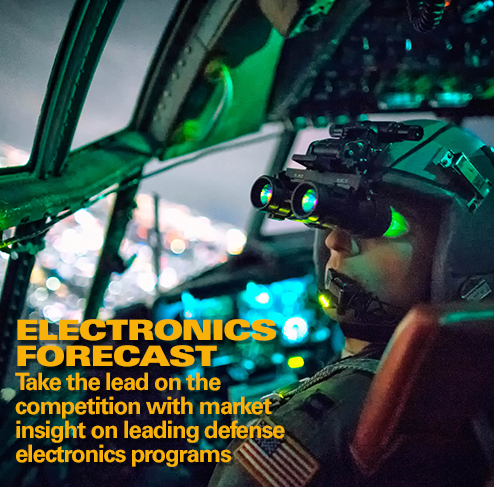 The author has used the Platinum Forecast System to retrieve the latest delivery forecasts, and for 2019, Forecast International’s analysts expect Boeing and Airbus to deliver 811 and 875 large commercial jets, respectively. 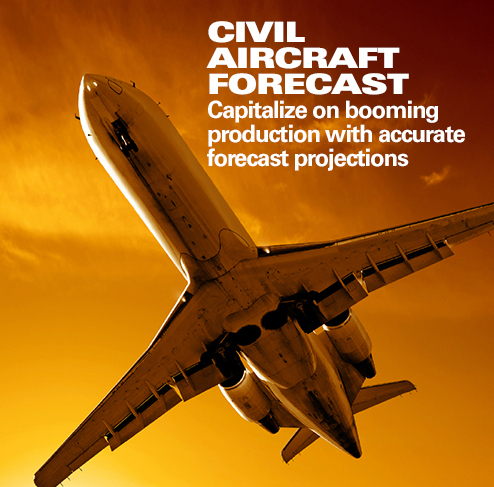 The forecast 2019 total for Boeing was 904 prior to the second 737 MAX crash and the subsequent grounding of the fleet and temporary cut in the production rate. These are the latest “live” forecast figures (adjusted frequently by FI analysts as new information comes in). 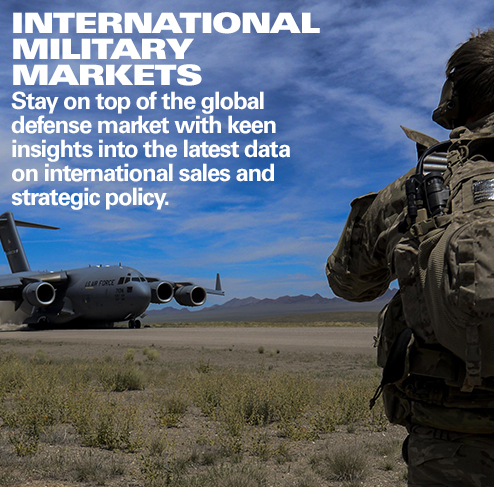 These figures exclude militarized variants of commercial platforms such as Boeing’s P-8 Poseidon, KC-46 and KC-767 tankers, the C-40, and Airbus’ A330 MRTT tanker. Prior to the 737 MAX crash, in connection with the release of its 2018 earnings report in late January, Boeing announced it was targeting between 895 and 905 commercial jet deliveries in 2019, a 12-13 percent increase from 2018. Boeing will likely reduce its target in the coming months. On February 14, Airbus announced that it aims for 880 to 890 commercial aircraft deliveries in 2019, equal to a 10-11 percent increase from 2018.